The 2015 Jeep Renegade made a big splash for being a little Jeep. The subcompact crossover SUV looks like what you might imagine if you bred a Mini Cooper with a Jeep Wrangler. It has the genes of a Jeep, but its silhouette is smaller and more toy-like. It achieves a unique look without sacrificing the quality for which Jeep is known. Jeep began building the Renegade at a Melfi, Italy plant in 2014 alongside the Fiat 500X, making it the first Jeep vehicle to be made exclusively outside North America. The Renegade and the Fiat 500X share a wide, 4x4 platform. The Jeep Renegade made its debut at the Geneva Motor Show in March 2014, so it does not have a long history. However, it has already made a splash in the automotive industry, and the 2015 Jeep Renegade has helped it establish a strong place in Jeep's history. The spirit of the Renegade's design is embodied in its technical construction, as well. The engine is both powerful enough to deliver fun performance yet efficient enough to make it an attractive vehicle for everyday driving. The base model has a 1.4-liter 4-cylinder turbocharged engine that puts out 160 horsepower and 184 pounds per feet of torque. The Renegade comes with either a six-speed manual transmission or a nine-speed automatic transmission, and it has front-wheel drive. While you won't be able to take on Moab in the Renegade, you will have a little more power for rough terrain, such as dirt roads, or when driving in bad conditions, such as snow or rain. The four-wheel independent suspension system provides a smooth ride no matter how rough the terrain. Since the engine is relatively light weight, as is the body, the Jeep Renegade is fuel efficient. The base model with a six-speed manual transmission gets 24 mpg in the city and 31 mpg on the highway. It has a combined fuel efficiency of 27 mpg. With the Jeep Renegade, you'll get the look of a Jeep with the handling and fuel efficiency of a smaller sized vehicle. The Renegade is ideal for everyday driving, whether you are running the kids to a soccer game or you have to pick up clients for a business dinner. The base model of the new Renegade will give you great performance for your everyday needs. However, if you want to increase your power for more offroading fun, you'll want to consider upgrading to the Trailhawk trim. The primary advantage of the Trailhawk trim is the more powerful engine. It comes with a 2.4-liter Tigershark engine with a nine-speed automatic transmission. The engine puts out 180 horsepower, which gives the Renegade a little more oomph for rugged terrain and steep inclines. The Trailhawk package also gets some design upgrades that are more suitable for offroad driving. For example, it comes with front and rear scuff plates, new front and rear fascia, and functional tow hooks. It also has a higher ride height to clear rocks and jagged terrain. While 4x4 drive is optional on all other versions of the 2015 Jeep Renegade, it is standard on the Trailhawk. You'll pay a little more for the Trailhawk upgrade, but if you love adventure driving, you'll find the price bump to be more than worth it. The Trailhawk trim starts at $26,990. 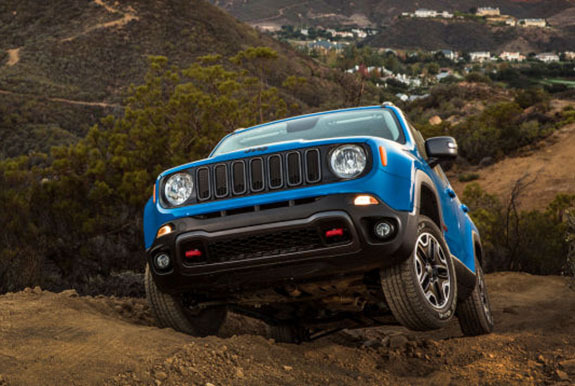 You don't need to be a thrill seeker to upgrade to the Trailhawk package on the Jeep Renegade. You may want to consider it if you live in an area that gets a lot of rain or snow or if you live in a rural area. You'll always be prepared for any kind of driving conditions when you have the Trailhawk on your side. You don't want to wait until you are stuck in the mud to start wishing you had opted for a 4x4 ride or one with more power. Like many of Jeep's other exceptional offerings, the 2015 Jeep Renegade comes with a variety of options and upgrades to help you get the exact design and functionality you want. The Renegade already comes with a number of excellent features, such as remote keyless entry, fold-forward front passenger seat, hill-start assist, and steel wheels. However, you can also upgrade with a number of different packages. The Popular Equipment Group includes an eight-way power driver seat, dual-zone climate control, a nine-speaker stereo system, power outlets and a 40/20/20 split rear seat. As the name suggests, these are some of the most popular options that drivers choose for upgrades. The Advanced Technology Group includes safety features like a lane departure warning, parking assist and forward-collision warning. Stability control, post-collision safety system, emergency braking assist, and traction control are just a few of the safety features that come standard on the Renegade. The Safety and Security Group add blinds-spot monitoring and rear cross-path monitoring for more comprehensive protection. The Cold Weather Group adds comfort and convenience features such as heated front seats, a heated steering wheel, remote start, all-weather floor mats, and windshield de-icer. These are options you'll be glad you chose when it's an icy morning and you're in a hurry to get out the door and on your way to work. You'll get going more quickly, and you'll be more comfortable in the process. Some additional options available for the exterior include a black roof, a full-size spare tire, 18-inch aluminum wheels, and removable roof panels. For the interior, you can choose from options such as satellite radio, keyless start, and a tonneau cover. You can get some of these options with the trim packages, as well as other design and mechanical upgrades. Of course, you can also choose from engine and transmission options, depending on the trim model your purchase. The 2015 Jeep Renegade is a great buy that delivers impressive handling and performance in one stylish package. With everything that the 2015 model offers, we can't wait to see what the future has in store for the Renegade.